I was baking a cheesecake today and... ahem... things did not go as planned. New York style cheesecake, as classic as they come. For my Russian blog, to share this wonderful American invention with the people of Russia :). You can easily buy cheesecake in coffee shops and restaurants there these days (after all, Starbucks is all over the place now), but few people know how to make it at home. So I decided, why not. Nice and reliable. How-evah! ALL the recipes out there make 10-12 servings. You know, for a nice, tall, regal cheesecake in a 9-inch springform pan. But who has 10-12 people readily available to consume this cake? Well, I did not at the moment. No big parties planned, no potlucks or bake sales; just the desire to bake and photograph a cheesecake. What did work great is this upside down plum cake. 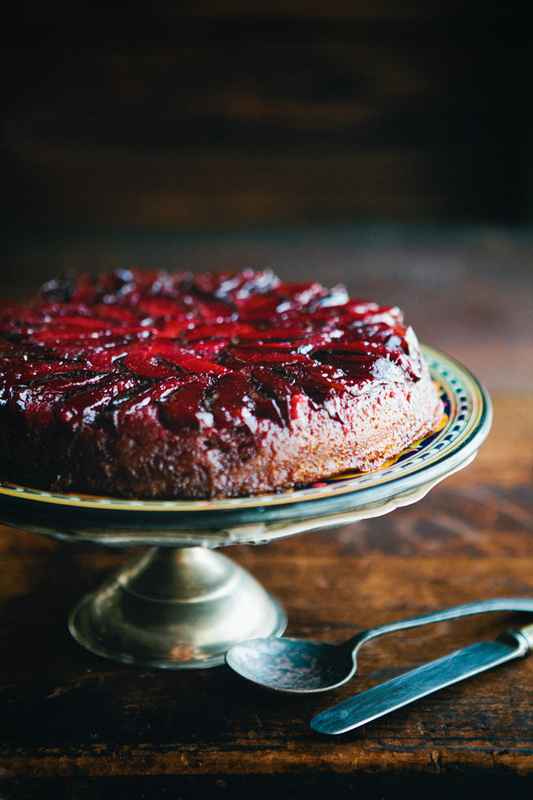 I'm not a fan of the classic upside down pineapple cake, and even Tarte Tatin leaves me unexcited, but plums work great with the idea! They are tart and nicely counteract the brown sugar sauce they're baked with. I found the recipe in Bon Appetit and over the years have tweaked it to match my taste. And fruit makes such a great baking ingredient (such as in my peach and apricot galette or cherry and dark chocolate galettes). Easy peasy! Preheat oven to 350F. Grease a 9-in pan with 2-in sides. In a skillet melt HALF the butter with honey and sugar over medium heat, stirring until smooth sauce forms. 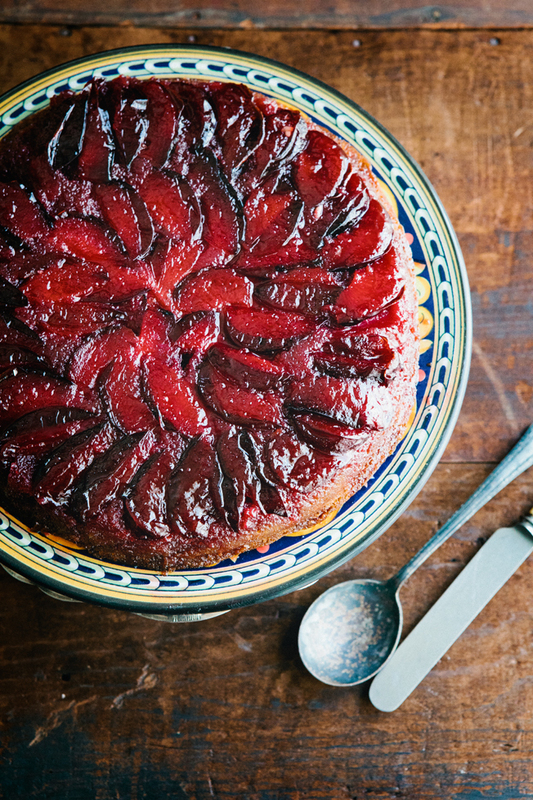 Pour sauce into prepared cake pan, arrange plum segments on top. Mix flour, baking powder, cardamom and salt in a medium bowl, set aside. With a mixer, whip remaining butter and sugar until creamy. Add eggs and both extracts and whip until white and fluffy. Add 1/3 flour mixture, mix until just blended. Add 1/2 milk, then 1/3 flour, the rest of milk and flour, mixing until just combined. Pour batter over plums, bake until golden, about 1 hr. Let cool in pan for about 15 min, run a knife around the edges and carefully invert onto serving platter. Serve warm, with whipped cream or ice cream. Your photos are so striking, and the plums look almost like cherries they are so small and richly colored. Sorry about the cheesecake fail, but I think you've redeemed yourself with this cake. I'm heading straight for the plums tomorrow morning at the farmer's market! I know! When I cut the plums open and found the bright red flesh inside instead of the expected yellow I realized I must take a picture of them raw; so gorgeous. Wow, this looks unbelievable!! 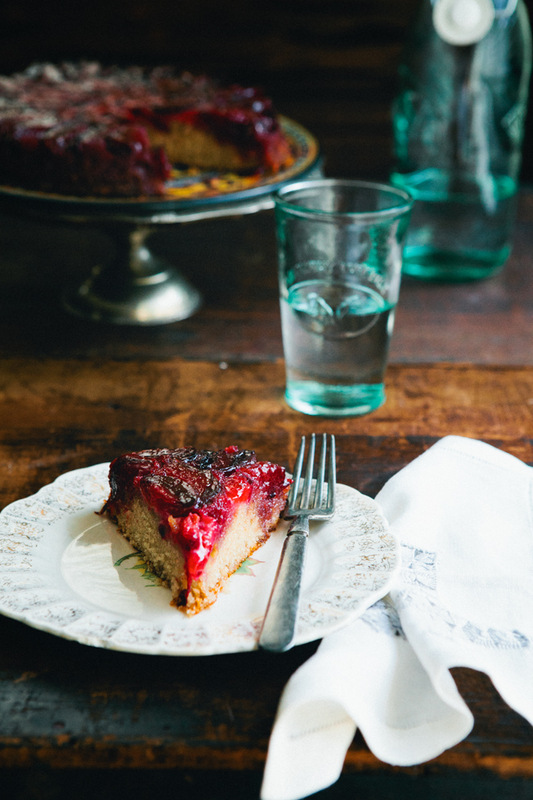 I've made peach, pear, and pineapple upside down cakes, but this plum one is a must make! The plums really work great with the caramel-y sauce. Thanks Riley. This is absolutely beautiful. Stunning, brilliant photos! A fantastic looking upside down! Love its vibrant colour. Thanks. 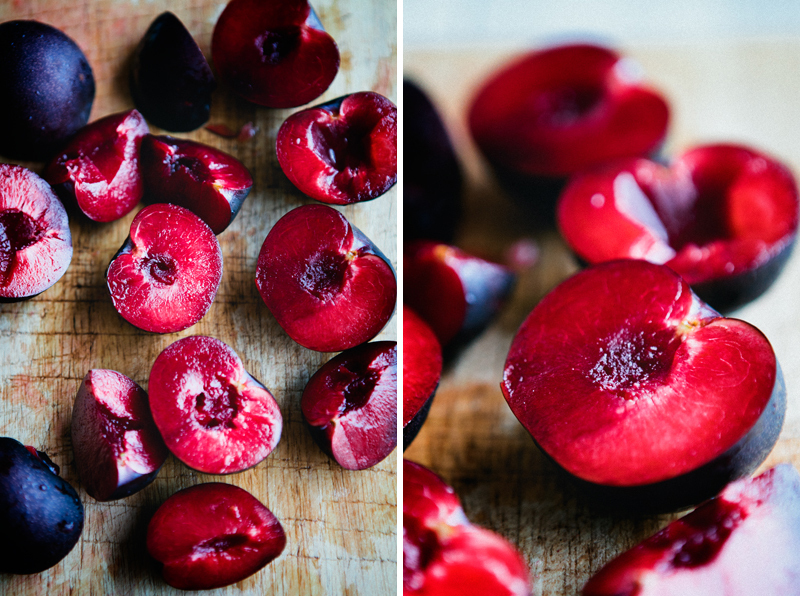 The plums had this rich, red color inside that came across very well in photographs. What a gorgeous cake! This is so much better than the traditional pineapple version! I agree! Not a fan of pineapple, and it doesn't look as good as the plums. Thank you Kristina. Yes, I just use the light from the window that creates a natural shadow. For these particular shots I did not use a reflector (I rarely do in general). The amount of shine on the cake can be controlled by a polarizing filter. Oh yum! I have never even thought about making anything with plum before. This looks perfect! Your photos are gorgeous! Absolutely gorgeous! And the recipe is different from any I have seen, so this makes me suuuper interested in trying it out in order to satisfy my sweet tooth and try something new. Very stunning! Hi Julia! Please let me know how it comes out if you do. Oh my God, your blog is amazing, your recipes, your photos....congratulations and greetings from Spain. I follow you! I just found you right now¡¡¡¡ I´m so glad¡¡¡ Your blog is great is so nice, with beautifull pictures and nice recipies. Be sure I´ll be right here to follow all your post. Hi Virginia, nice to meet you! What a beautiful photos!! Your blog is amazing! Somehow, judging by your usename, I knew :). Hi Aniko! I should have done better research! But it worked out fine in the end, I'll post about it soon. Look, just look at all that jewelled gorgeousness! I recently baked an upside down apple cake drench in booze....and I can well imagine yours for a treat in a wispy summer's evening. Beautiful photographs. Tried it, delicious! Did not have cardimom so I substituted cinnamon, then just and 1/8 each of allspice and cloves. Great! I'm glad it worked. I've also baked it with cinnamon and liked it. This turned out to be a beauty that made a good gift for a new mom! And tasted all the better the next day. I won't use a springform pan for an upside down cake next time I make this. D'oh. That's so great that you tried it and liked it. I actually made the mistake of using the spring form pan the first time around too :). I need to put in the warning. I just discovered your blog via tastespotting. The photos are so absolutely gorgeous! The plums look like rubies and I love how you style things. Many thanks for such beauty on a grey rainy day. Oh Shana! Thanks for stopping by and for your nice words. I've just made this cake. 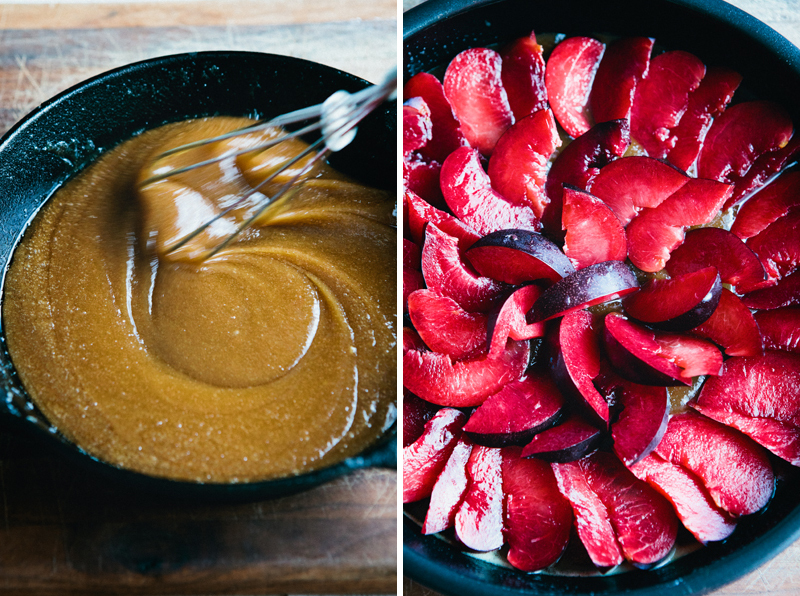 Bought some plums yesterday not so sweet to eat fresh, so this recipe was perfect. Just turned it out and looks amazing. Cant wait for the family to get here now! Tart and firm ones are perfect for this recipe. I'm glad you liked it. I've had such different upside-down-cakes, but not with plums! I tried this today. Great recipe. Although I did find that the sauce separated quite a bit and did not look smooth like your photo. This did not make too much difference to the final result. I will be cooking this again! Thank you for your review; it will be helpful to others! 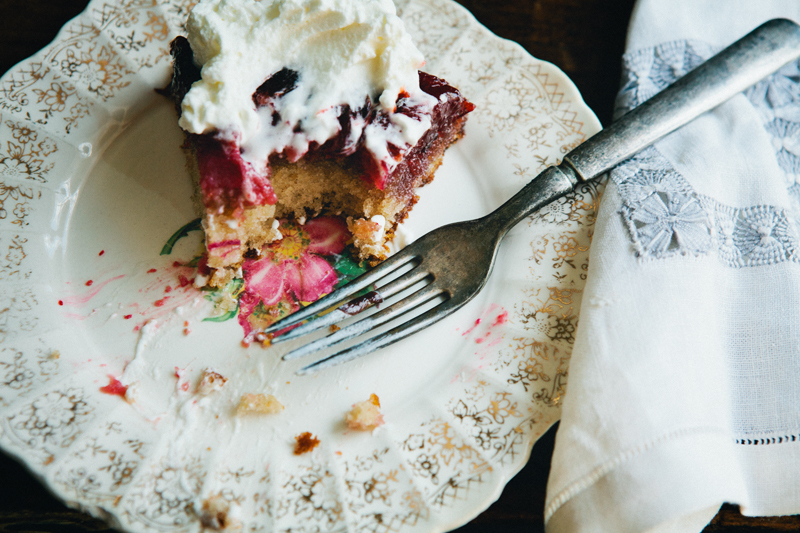 I'm staying with parents who were given a huge bag of plums yesterday that were dead ripe, so I made this cake for them and it was SUCH a hit! Like one of the above posters, the plums were soft but not overly sweet, so the caramel helps counter that. I also made it with cinnamon and a touch of ginger because mom doesn't have cardamon - delish! Lastly, because my parents are diabetic, I used agave syrup and sugar replacements, and it STILL turned out amazing! Thank you so much! This is awesome :). Thanks for the review. I just raided a prune plum tree down my street the other day, and we have guests coming for dinner, so I'm making this... Heading of to the kitchen in just a moment! Can't wait! Ok, So I'm back! I made this and it turned out wonderfully!! I don't think I've ever made an upside down anything, so I was very happy! I didn't have any cardamom, so I used cinnamon, and a dash of ginger and mace. I served it up with whip cream lightly dusted with purple sprinkles, and a fan-sliced plum, and it was just beautiful.... Only problem I encountered was that I served it before I took a picture. Drat! Oh well. Thanks for the recipe!! I'm sure you could use this exact recipe for any type of fruit too! Wow, your presentation does sound beautiful. I'm glad you liked it Nikki. also the crust was not as brown as shown in your pictures, though the cake was perfectly cooked and quiet soft and flaky! Sure enough, this being an American dessert, it is pretty sweet. I'm glad it worked for you Nidhi. Planning on making this cake for tomorrow, but I'd like to make it today; should I turn it out today or wait till tomorrow? does the caramel run all over the plate? Planning on making this for tomorrow but i'd like to actually make it today as I have a lot to do tomorrow; should I turn it out today or leave it in the pan and turn it out tomorrow, maybe after reheating it a little? Hi Paula, I am sorry I did not respond earlier. The caramel does not run on the plate, it gets absorbed into the cake. It is safe to invert it on the plate the day before. It does look best the day it is baked though.